This Christmas, I am going to surprise my friends with my personalized homemade gifts with the touch of love and care. Each of these 7 homamde gifts that I had made over the years were given to my family members and friends regardless of occasion. These Christmas gifts that I had made used recycle items, old or store away items that had became best Christmas gifts ever! If you are tight on a budget and your Christmas gift list is long, try to make these 7 handmade gift ideas and your friends would be in for a surprised that you could handmade these special gifts with your talented hands! Store bought gifts with skyrocketing prices are on display at shopping malls, departmental stores and gift shops. 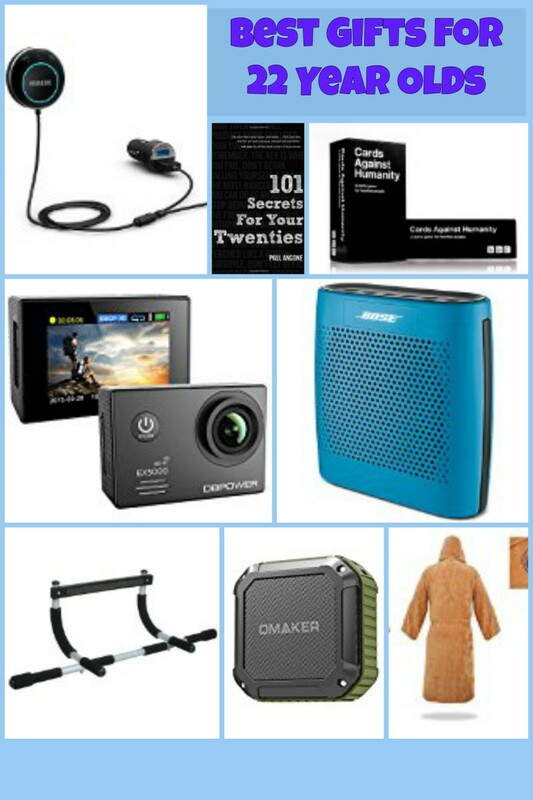 Wasting time in choosing the perfect Christmas gifts for friends may take hours or days with a wide variety of gifts available in the market. Homemade gifts are the perfect gifts made from your heart, time consumed with creativity. The one and only gift. Earth Day can be on any day. Reuse old card boxes, color construction papers and ribbons or old gift wrappers to recycle them into a perfect Christmas gift. 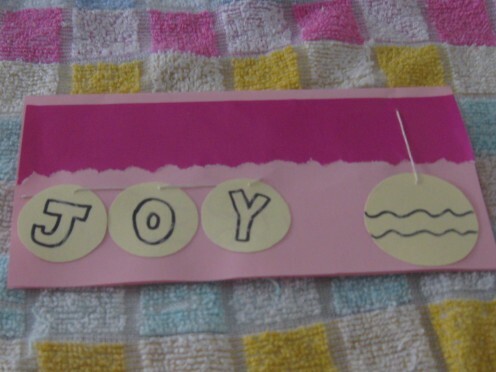 Bookmark and Christmas cards are easy to make and useful to your friends. Don't let your baking talents hidden at home. Show it to your friends with your baking skills. Baking cakes, cookies and muffins from scratch are easy as a pie with lots of YOUTUBE tutorial videos available online. 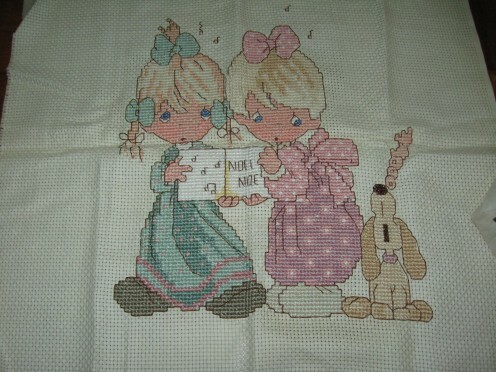 A trendy picture of handmade sewn picture related to Christmas would make a wonderful gift for your friends. They would appreciated your talented gifts, treasure it for a long , long time. It is non-edible, non-breakable and non-replaceable. Get free recipes from newspaper, magazines or old cook book. Bake the cookies or cakes yourself and take photos, jot down the recipe steps with detailed instructions. 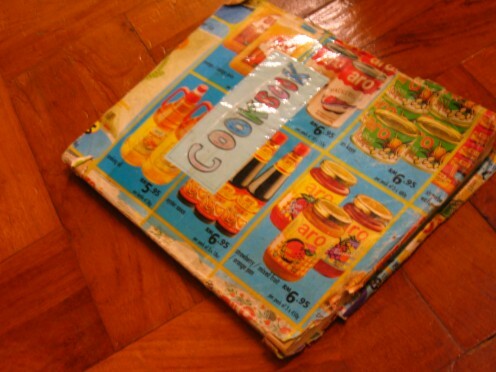 Recipes books are expensive and outdated after a year. It is best to use manilla card. 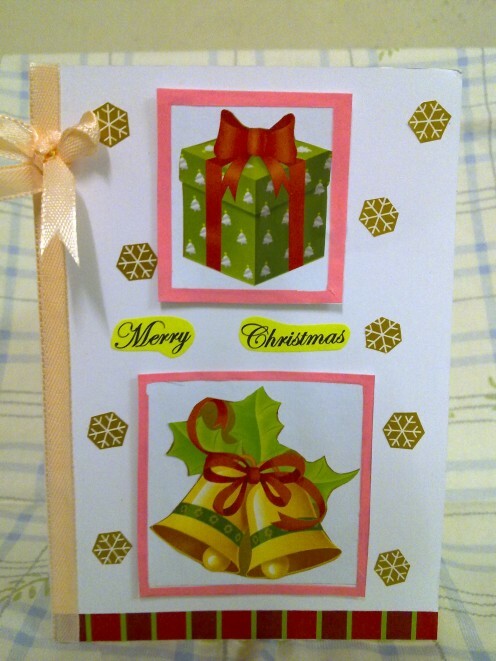 Decorating the front of the card signifies your creativity. Write a special Christmas greeting message inside the card with a black or red marker. 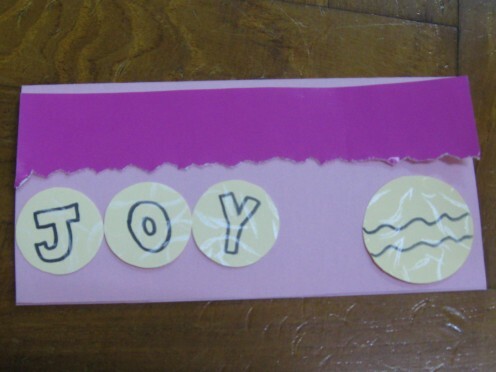 Here's a simple JOY CARD which I had recently made. Measure and cut the manilla card 6 x 6 inch. Fold into half. 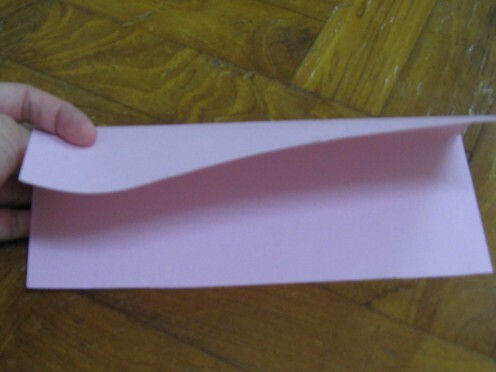 Cut the pink/red color paper 6 x 1.5inch strip. Hand tear the bottom strip. 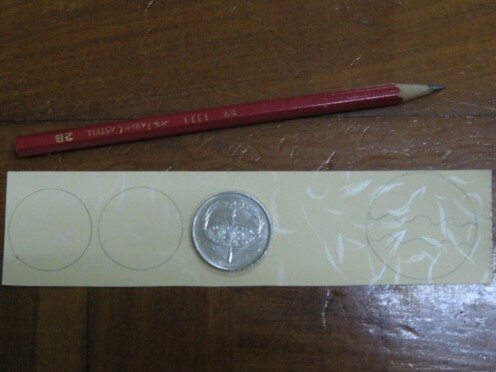 Cut the cream color paper into 4 small circle using a coin or bottle. Draw the letter J, O and Y on each circle with a black marker. Draw 2 wave lines on the last circle. Sew the circle joining all the 3 circles onto the manilla card and tie a know at the back of the card. Glue J,O and Y onto the manilla card. 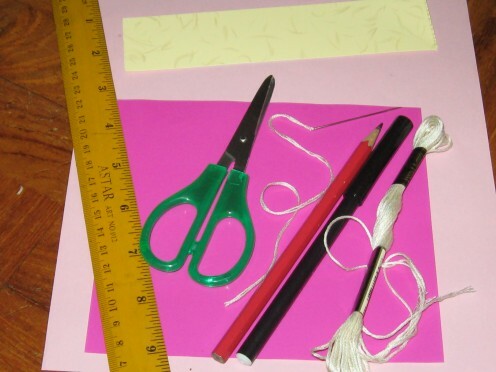 Sew the last circle onto the pink/red color card and tie a knot. 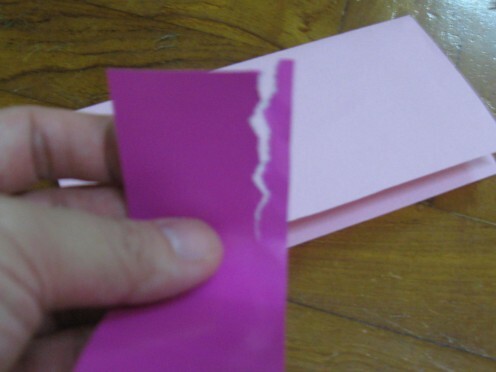 Glue the circle onto the manilla card. 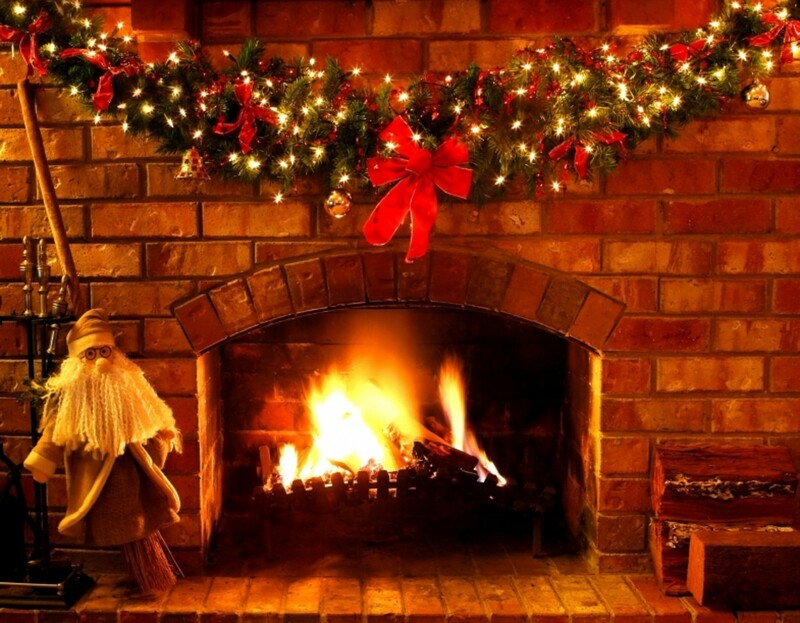 Write a "JOY TO THE WORLD, CHRISTMAS IS HERE!" or any desired Christmas message you want inside the card with a red marker. I needed a pair of sharp scissors, but I bought 3 ! 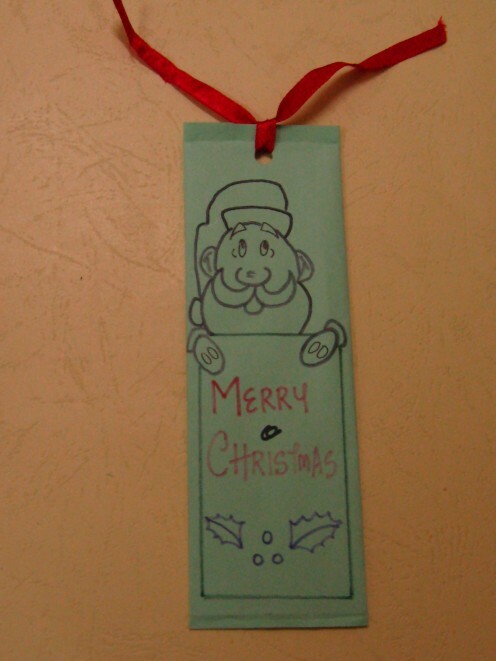 Yes, make your very own Santa Claus bookmark for your friend. I'm sure your friend will always remember you every time he or she sees it. You can color it with crayons or color pencils to brighten up the picture. Done. You can add some colors to the picture. Don't spend money on buying cookies. You should try your hand on baking some cookies for gifts. Furthermore, they are made originally from you. 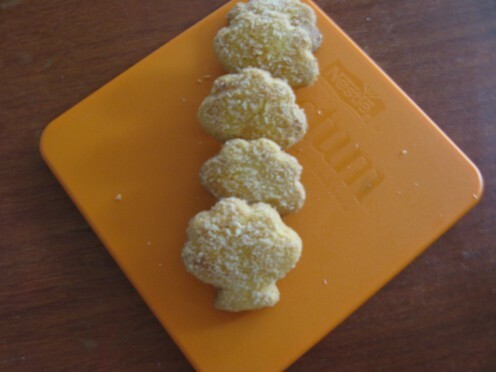 Kids and adults love cookies at all festive seasons. After baking them, store them in air-tight container, wrap it up with a transparent color plastic wrapper and tie it with a red ribbon. Don't forget the Christmas card! I am sure you are going to like this. 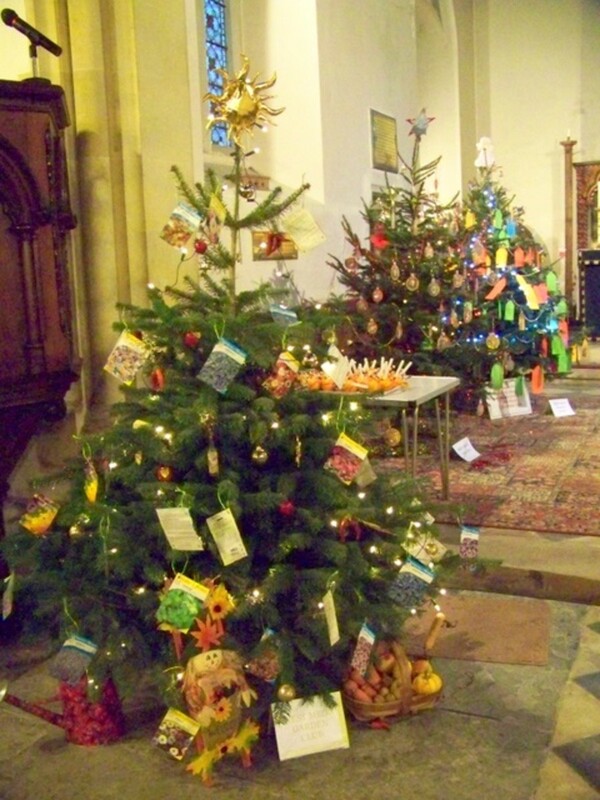 If you are good at cross-stitching, sew a Santa or Christmas tree and frame it up. You don't have to stitch a big area because it takes too much time. Remember you are racing against time now. Find a small picture and maybe just stitch "MERRY CHRISTMAS" will do. 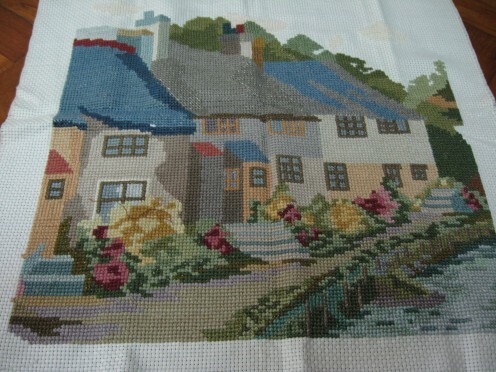 Cross-stitching with frames always brings fond memories to me. 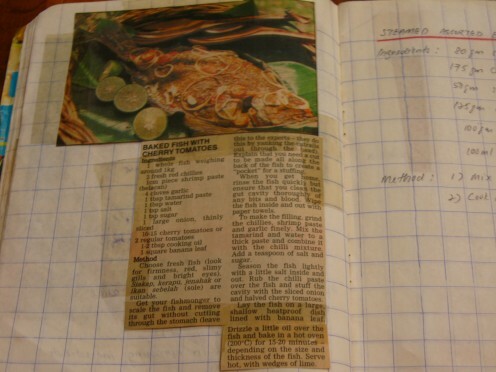 If your friends or family members love baking or cooking, gather all your newspaper or magazines cuttings, photos, old grandmother's recipes and paste them into a book. Add some color papers with shapes and sizes, stickers, price tags or pictures drawn. Make your recipe book comes alive with various photos, advices, hints and tips. I have one which I made myself. Mostly from newspaper cuttings because they are free and colorful with wonderful useful tips. I use supermarket brochure for the book cover and handwritten the title instead of using computer printouts. The instructions, methods are taken from my mom, neighbors and aunts. Which do you prefer to receive as your Christmas gift? Give me money, I buy the cake on my own! Cherry Coconut Cake is another great additions to my cake recipes. Desiccated coconut makes the cake heavier, compact and full of coconut flavor while the cherries are wonderful to bite for there are crunchy to me. Some people prefers to eat than receiving presents. My friends are the ones with sweet tooth. Luckily for me, baking is my favorite hobby. 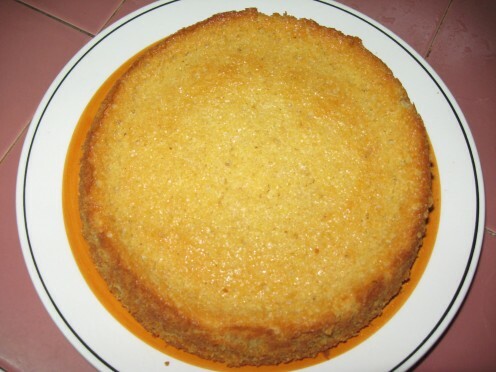 Lemon cake is sweet not sour at all because you uses the lemon grated skin and very little lemon juice. Choose other flavors instead like chocolate, strawberries, blueberries or marble-cake. Freshly bake from oven, send your cake present immediately before it turns soggy. Put them in fridge to keep the cake interior intact. I love this non-stick Muffin Tray! 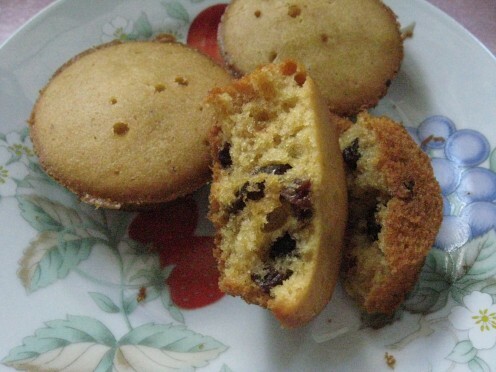 This muffin recipe is simple, quick and easy and if you are using a twelve hole muffin tin. The inner texture is moist and soft, doesn't stick to your teeth. There are wide variety of muffins which are healthy , delicious and convenient to bring along especially to work, school, picnic and great for a quick snack while driving in a traffic jam. A perfect gift for small eaters.